The 34th Division constructed a memorial dedicated to the 'memory of Officers, Warrant Officers, and men of the Artillery and Engineers of the 34th British Division who fought near this spot October-November 1917' next to a to a German pillbox near Poecapelle. The 34th Division took part in the sixth and final phase of 3rd Ypres (22 October - 6 November), in an action designed to secure the high ground around Passchendaaele, taking part in the opening attack on 22 October 1917. Memorial to 34th Div. artillery and engineers, near Poelcapelle, sited next to a German pillbox. Anyone who has visited the battlefields of the Ypres salient will be well aware of the fact that the Germans made much use of concrete pillboxes. As trenches were impossible to dig, the defence was placed in strongly concreted "pill-boxes" in the ruins of barns and farmhouses. The average thickness was around 3 feet, which was proof against all except the heaviest of shells. The German pillboxes were not built to standard designs, but were rather adapted to their surroundings and the extent of the ruins on which they were erected. They were sited to mutually support each other and were quite capable of breaking up and delaying a line of attack. The 34th Division was tasked with attacking such a line of pillboxes. The strong construction of the pillbox can be appreciated in these two images. The pillbox was part of the same defence line of pillboxes as the two in the German Langemarck Cemetery. "Pillbox" fighting required great initiative in junior commanders. The method of attacking in waves would, and did fail against pillboxes. New tactics were required. The tactics adopted by the British in the summer and autumn of 1917 now involved the sections of a platoon advancing in file, giving the chance of overwhelming a pillbox by the co-operation of the nearest sections while the rest continued their advance. Each platoon was to push on until it was held up by the organised resistance from a pillbox. One section was then to manouvere into fire positions and rake the pillbox with Lewis gun and rifle gun fire, occupying the attention of the pillbox garrison. The neighboring sections then moved around the flanks and rushed the pillbox as the fire section kept up its sustained fire on the pillbox loopholes. A plentiful supply of phosphorus bombs was usually provided for pushing through the loophole and igniting the interior of the pillbox. This was a difficult enough task in good ground conditions, but almost impossible if troops were 'floundering' in the mud, when they were easy targets for the German defenders or if the pillbox loopholes could not be subjected to fire because rifles and Lewis guns became jammed in the mud. The 34 Division had mixed success and was relieved by the 50th and 57th Divisions on 23 October. One can appreciate the difficulties of attacking such pillboxes, and the wide fields of fire this particular one enjoyed. 'They [the Artillery] had a very rough time in the muddy margins of the Broembeck, and they lost heavily, but they did right good service. The 152nd Brigade covered our front on the fatal 22nd, and fired seven thousand eight hundred and fifty-eight rounds on that day. An ordinary day's shooting was about two thousand three hundred rounds. After our departure they covered the fronts of the divisions that relieved us, and on the 26th they took their share in the attack by the 14th, 18th Corps and the French Army'. 'The 34th Division has shown the greatest pluck during its short stay in the 5th Army. Ill fortune and bad weather have prevented its operations being rewarded with complete success, but, despite this, the Division has contributed to the successful coarse of the great battle now in progress. Not the least of its achievements has been the fine work of its Pioneer Battalion on light railway construction'. During October, of only which 16 days were spent in the forward area, the Division had a total of 303 Officers and Other ranks killed, 1,089 wounded and 405 killed. Nearby is a small neglected private memorial to a French Brigadier of the 2e Regiment Chasseures, whose name is now hardly legible. The 34 Div. memorial is well known on the Ypres 'tourist' circuit, but I wonder how many people take the time to visit this memorial, or even realize the French took part in 3rd Ypres! Above: Small private French memorial to a Brigadier 2e Chasseurs. All remaining British pillboxes in the Somme area date from 1918, after the lines had stabilized after Ludendorff's Spring Offensive, which commenced on 21 March 1918. The German 1918 Spring offensive swept over the old battlefields of the 1916 Somme Offensive, with the Germans taking the dominating Serre ridge again. A prominent feature in the area was Jeremiah Hedge, which behind the the Germans had established dugouts and machine gun posts. If the Germans could be driven off this high ground back into the valley below, the British front line would be more secure and the opportunity for the Germans to resume the attack in this area on the high ground would be denied to them. The task of taking Jeremiah hedge fell to the New Zealand Division, which completed the task on 30 March. The German Offensive died down in Somme area in early April as Ludendorff turned his attention to the Lys for Operation Georgette. In Jeremiah Hedge, a British observation post can be found, constructed during the summer of 1918, giving excellent views down the valley towards Serre. Excavation has shown that it was a variant of the Moir pillbox design, constructed partly from pre-cast concrete blocks and concrete poured in-situ. Above: British observation post, Jeremiah Hedge. Image 1- the prominent feature of Jeremiah Hedge. Images 2 to 4 - the front of the observation post. Image 6 - view from the observation post looking down the valley towards Serre. A standard 3rd Army pattern observation post constructed during the summer of 1918. One of several of this pattern in the area - I posted about another example at Bienvillers last year. This example is in good condition. Above: Standard 3rd Army pattern observation post, Berles-au-Bois. At Bienvillers can be found the remains of a British machine gun post built in the summer of 1918. An unusual structure, it appears to be only partially complete - it lacks a roof - and is made of a mixture of mass brick work and concrete. It seems to have a concrete front and embrasure, with mass brick side and rear walls. The remains of another brick wall is nearby. Was it never completed, or perhaps a roof of elephant iron covered with earth or sandbags was provided? Whether brick was used to aid the camouflage of the post as a building or because it was an easily available material when concrete resources may have been prioritized for the GHQ Line I'm not sure. Mass brick work of 7 ft was said to be proof against 8" shells - the walls were are not quite that thick, perhaps being only built to be proof against 6" shells. Above: British machine gun post, Bienvillers-au-Bois. Ploegsteert Wood is about 9 miles south of Ypres. The area saw heavy fighting in 1914 as the Germans tried to take Ypres in their drive to the coast. The British line held, but Ypres formed a dangerous salient in their lines, with the Germans holding the dominating high ground. Ploegsteert Wood (map 1) became a quite sector after this initial fighting, with the subsequent fierce fighting for Ypres taking part further north in 1915 and 1917. The Germans captured the wood in April 1918 (map 2) during the battle of the Flanders Hills, with the British re-taking the wood at the end of September during the Advance to Victory. 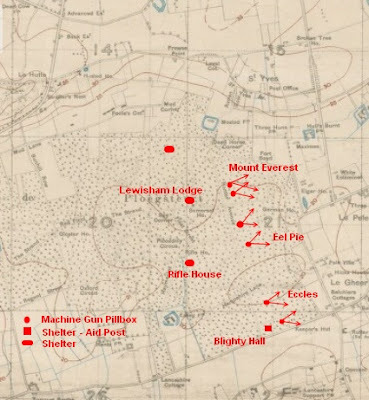 Within the wood there still can be found a number of shelters and machine gun pillboxes (map 3), the subject of this post. 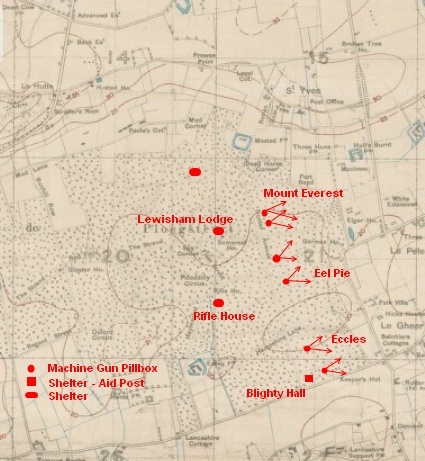 Map 3: Pillboxes and shelters plotted on a 1917 trench map of the wood. Along Hunters Avenue there can be found six machine gun pillboxes (a seventh can be found on the west side of the wood, but we did not visit this one). A breastwork ran along Hunter's Avenue, with small 'forts' - i.e. machine gun pillboxes - sited along its length. Their purpose was to sweep the wood with fire and prevent any enemy approach along the woodland rides. They were built in 1916, and are remarkably strong, solid and well built constructions: it was not only the Germans who built concrete pillboxes in the First War! A variety of shuttering was used, including corrugated steel sheets, wood and sandbags. They had one or two machine gun embrasures and some also have an observation or rifle embrasure. On one of the pillboxes, the embrasure is stepped, a rare feature in WW1 pillboxes.On the inside, there is a slot below each machine gun embrasure, presumably to take one leg of the Vickers tripod. In a couple of the pillboxes, with clean interiors, it is clear that the tripod leg have to have been at a horizontal level, the other two legs splayed out normally. Presumably the tripod would have been weighed down with sandbags. In the interior of these pillboxes is a brick built wall. This may have had two purposes - a seat for the gunner and also to keep water from running into the interior. In the other pillboxes it was not possible to determine the level of the floor. Some have a brick wall across the entrance to the pillbox, clearly to keep out water. The following set of images are of the pillboxes, from north to south. Two pillboxes sited adjacent to each other. The external shuttering used on both was sandbags, which gives them a rough appearance, but they are stout constructions. 6th image: entrance to one of the pillboxes. The brick wall in this case is surely to keep out water. Not sure of the name of this fort. My favorite of the group. External shuttering probably wood. It has a stepped embrasure. A fault line is clearly visible between the pouring of the walls and the roof. Above: Next 'fort' south from Mount Everest 'forts'. Note stepped embrasure and fault between poring of walls and roof. The name Eel Pie comes from the name of a light trench railway running along the adjacent track - the Eel Pie Line. Constructed using both wood and corrugated steel sheet shuttering. Again, a clearly visible fault between the pouring of the walls and roof can be seen. This one has a smaller second observation/rifle embrasure. Above: Eel Pie 'fort'. Note second, smaller embrasure (image no.5) and corrugated iron sheet shuttering for the rear wall (image no.6). Above: Eccles 'fort'. Note the slot below the embrasure (forth image) is quite a bit above floor level. Also note the brick wall running across the extreme bottom of the image, just the right height for a gunner to sit on. Not sure of the name of this fort. The most southerly of the 'forts' running along the length of Hunters Avenue. Note the blocked embrasure (second image) - why it has been blocked or the purpose of the small aperture I'm not sure. A not very substantial shelter that has been destroyed by shellfire. The exterior shuttering is corrugated steel iron sheets while the imprint of sandbags are clearly visible on the interior walls, suggesting it was constructed over an existing sandbagged shelter. Above: Lewisham Lodge. Note imprint of sandbags on interior wall (top image) and the use of corrugated iron sheets for the external shuttering (bottom image). A regimental aid post. The inscription 'Blighty Hall' can be clearly seen above the entrance. A simple shelter constructed using external shuttering of sandbags and internal shuttering of more substantial 'elephant iron' sheets. It is probable the sandbags would have been left in situ after pouring to give further protection. Above: Blighty Hall. Note inscription on lintel (first image) and imprint of sandbagged shuttering (forth image). The entrance to a partly sunken shelter is still visible today at the site of Rifle House. The name originates from timber huts built by the 1st Rifle Brigade in in 1914. Another partially destroyed and not very substantial shelter consisting of 'elephant iron' and concrete, in the vicinity of Toronto Avenue. Probably connected with a nearby light trench railway called the Prowse Boyd Line and later the Vancouver Railway.